Our Fire Truck for the early childhood playground creates an exciting dramatic play activity for your children. 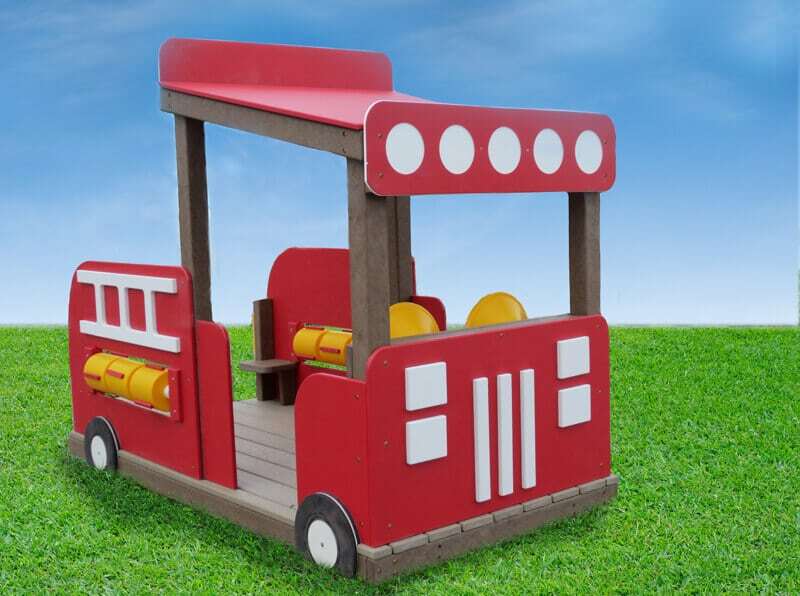 Complete with steering wheels, bench seats, and sound tumblers, the children will love jumping on the Fire Truck and racing to the rescue of their fellow students on the outdoor preschool playground. At the front of the Fire Truck there are two steering wheels and a bench seat so two children can play cooperatively. On the back of the Fire Truck, there are two seats for additional fire fighters. On the sides of the Fire Truck we’ve installed sound tumblers for the children to spin around and hear different sounds while pretending to be pumping water or sounding sirens. This preschool play equipment will be a great addition to your outdoor classroom. The Fire Truck can be built without a floor and can be priced on request.